In a notably successful venture between the Captain Cook Society and the Government of French Polynesia, the Captain Cook memorial has been restored and his name is once more commemorated at Point Venus, Tahiti. Nobody who visits Point Venus at Mahina on the northern tip of Matavai Bay, Tahiti, can fail to be inspired by the sheer beauty of the place. The soaring, forested mountain shards sweep down to the palm-fringed lagoon and the tongue of black volcanic sand, just as William Hodges painted the scene on Cook’s second voyage. After all, it was here that Wallis anchored in the Dolphin, to become the first European so far as we know to discover Otaheite (or King George’s Island as he named it) in 1767. His glowing account of the climate, customs and people, led to the decision to send Cook to the island in Endeavour to observe the Transit of Venus in June 1769. He built his Fort Venus on the sandy tip and indeed named it Point Venus: a name that stuck – Pointe Vénus to today’s French-speaking population – and to which he returned on each of his next two voyages. The importance of this lovely site in the subsequent history of the Pacific is amply attested by the monuments to be found at the Pointe Vénus tourist park. Here, for example, the Bounty anchored to collect breadfruit in 1788 … and to which it returned to collect women, en route to Pitcairn, after the mutineers threw the breadfruit overboard and set Captain Bligh adrift in his open boat. Here in 1797, the first members of the London Missionary Society landed to begin preaching the Gospel. And here, too, one finds a lighthouse – a pharos – designed by the father of Robert Louis Stevenson, with a plaque on the wall commemorating the author’s visit in the 1880s. Surely, no other few acres in the South Seas can be more crowded with historical association. Yet, until recently, of the many illustrious names engraved in stone or bronze among the groves at Point Venus, there was one very notable omission: that of James Cook himself. Cook memorial before restoration. Pharos behind. 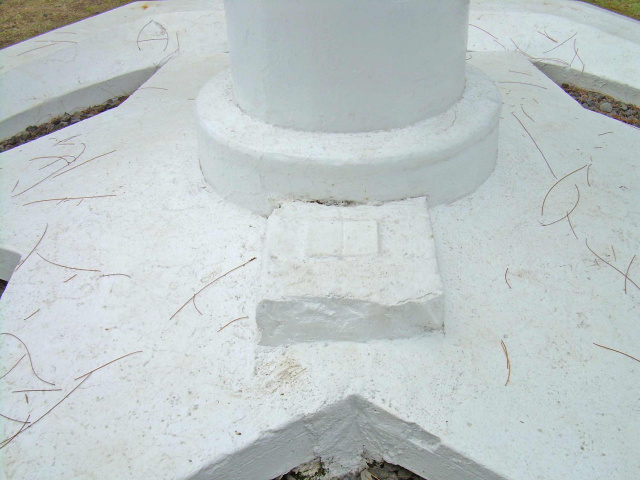 Visitors, searching in vain for some acknowledgment of the Captain, would find themselves drawn to a rather plain memorial on a patch of grass not far from the lighthouse: a white stone column, perhaps 1.5 metres high, supporting a stone sphere, and sitting on a six-pointed navigational star. It is raised on a hexagonal plinth which then was topped by an iron railing fence. One assumed this was a memorial to Cook. Indeed, the more one looked at it in the absence of any other commemoration to the man whose Point Venus became the radial point for each of his three defining Pacific voyages, the more one felt it had to be so. But there was no plaque on this modest little monument. No name. A raised slope where a plaque had once been. But that, alas, appeared to have been removed many years ago. So the column stood in all its anonymity until early 2009, when a Sydney member of the Captain Cook Society in Australia, my friend Margaret Simpson, brought the subject forward for discussion at a meeting of the CCS-A. Was it in fact a memorial to Cook? If so, where was the plaque? If not, who was it to? And what, then, could the Society do to get an appropriate memorial for the Captain at Point Venus? I undertook to make some enquiries. And in this I was assisted by two pieces of very good luck. The first was to have as my neighbour Mme Laurence Beau, Political Counsellor at the French Embassy in Canberra where I live, with whose family we’ve become good friends, and who helped immeasurably with contacts and in translations of my correspondence with the authorities in French Polynesia. The second was to know the Society’s president, Cliff Thornton, with his great knowledge of matters pertaining to Cook, whom I met during a visit to the CCS annual meeting at Marton in 2006, while researching my book Captain Cook’s Apprentice. An enquiry to Cliff about the monument quickly brought a response in the form of an article from the January 1937 edition of The Geographic Journal, the official publication of the Royal Geographical Society, which answered the first part of the mystery – though in doing so created yet another puzzle. It appears that the column was indeed erected for Captain Cook in 1901, at the suggestion of the RGS and the Royal Society – at whose behest, of course, the Royal Navy had sent Cook to observe the Transit. In fact the construction of the monument was paid for by the French authorities at Tahiti, though this decision came too late to be cast in words on the brass plaque sent out for the occasion, and acknowledgment had to be crudely scratched onto the tablet afterwards. It wasn’t the only mistake to be found on the plaque. For the opening line stated quite baldly that the memorial had been erected by Captain Cook himself, to commemorate the Transit observation, and that it had been “restored and fenced round” (interpolated, “by the local administration at Tahiti”) and the plate placed there by the two Societies in 1901. Now, so far as we know, Cook erected no such monument. The column stands several hundred metres from the presumed site of Fort Venus, and on the wrong side of the river. The inscription, in fact, was a Monumental Error – Erreur Monumentale, as a scathing article in a Polynesian journal described it in 1978; and it should not surprise that such an embarrassment might well have been discreetly removed from the monument. Nor, indeed, surprise that in the three decades since then it’s real commemorative purpose have been forgotten. How did such a mistake occur? The answer rests with a shaped piece of coral rock, about 12 inches square embedded with a small brass plate engraved with an East-West directional line, which also sits on the monument’s star on the opposite side of the column to the plaque. Painted white like the rest of the monument, the stone is entirely unremarkable to the visitor. Yet during the later years of the 19th century, local tradition came to associate this stone with Cook. It was sometimes referred to as “Cook’s stone”, and this assumption was referred to by a visitor, Mr A.L. Anderson, when he wrote to the RGS in 1899 complaining that “the coral slab placed by the great navigator” was lying on the ground exposed and unprotected. Mr Anderson’s letter was the catalyst that led to the present memorial being built. But it seems that the oral tradition of “Cook’s stone” may well have confused him with somebody else, as sometimes occurs; and that instead of one stone we have to account for three or even four. It’s a complicated story related by The Geographic Journal: but in brief, a large stone was placed on the Point Venus spit in 1839 by the US Commander Wilkes, and marked with a line pointing to Dolphin Shoal, where he was attempting to measure tidal heights and coral growth. It was still there when the French Lieutenant Le Clerc visited in 1869, and he placed two coral rocks inset with copper as guides on either side of Wilkes’s stone. They were there when Cook’s memorial was unveiled in 1901, but have all since disappeared … possibly washed out to sea sometime between 1902 and 1922-33. Another piece of copper was apparently also let into a coral rock not far from the lighthouse, where the Cook memorial now stands – though it is not clear from the records whether Le Clerc did this or somebody else. Wilkes, perhaps? There is no mention in Cook’s copious journals that he did ever so. 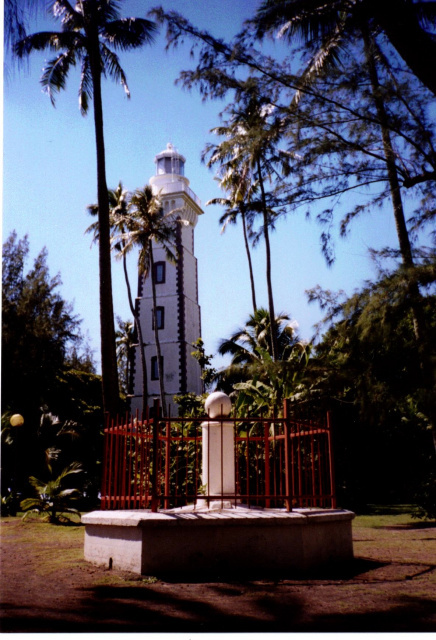 Nevertheless, a report to the RGS by the British Consul in Papeete said that the local tradition of this being “Cook’s stone” was established before the lighthouse was built in 1868. Certainly it was widely held by 1899 when Mr Anderson wrote his letter, though the how or the why of it has long been lost in the fallibilities of human memory. However that may be, the information was sufficient for me to contact the two learned Societies, though I received no formal response, and also to approach the French Polynesian authorities with a request that a new plaque with appropriate wording be placed on the Cook monument at Pointe Vénus. He also sent me some very useful pieces of information … a photograph of the original plaque … the critical Erreur Monumentale article … current photographs of the monument … and a Government announcement in the Tahitipresse of July 2009, relaunching plans to upgrade and improve the Pointe Vénus tourist park. It was a perfect opportunity for me to express the hope that the restoration of the Cook memorial might also be part of this revived management plan. And to my delight – and I’m sure to the satisfaction of all members of our Society – this proposal was taken up by the Government of Tahiti and the Tourism Service. There was a delay following a change of administration last year, after which another letter was written to the new Minister, M Steeve Hamblin. He sent it to his department, and I was fortunate to receive an email expressing interest in our proposal from M Guillaume Raynal of the Tourism Service. In consultation with Cliff Thornton, our Australian president Ted Tierney, and other colleagues, I drafted a form of words for a new plaque, with the suggestion that they be engraved in French, English and Polynesian. I know from a subsequent email that M Raynal and his staff found our information most useful for what had by then become a “phantom” monument (si fantomatique)! And a new plaque was ordered pretty much at once, using our inscription. That was in November last year. By late February 2011 I received another message from M Raynal with photographs, advising that the restoration of the Cook memorial was complete. It has been repainted white, the iron railing fence has been removed (though he advises it will be under the constant supervision of park rangers to look after security), and the new plaque has been installed on the vacant pad. 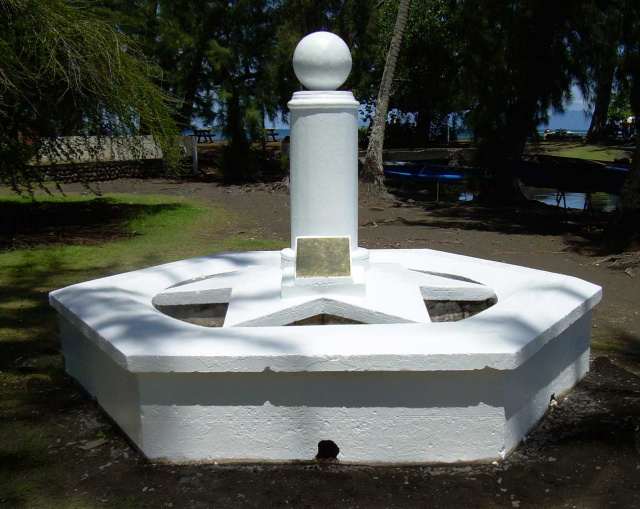 The people of Tahiti built this memorial to CAPTAIN JAMES COOK RN who observed the Transit of Venus near this site on 3 June 1769 during his first Pacific voyage, and gave the name Point Venus. He returned here on his following two voyages. Erected 1901, proposed by the Royal Society and the Royal Geographical Society. Restored 2011 by the Government of French Polynesia at the suggestion of the Captain Cook Society. Whether another small plaque should be placed by “Cook’s stone” mentioning the oral tradition, is a matter of continuing discussion. But all in all it’s been a happy combination of circumstances and a satisfactory outcome. Naturally we have expressed sincere thanks to the authorities involved. The author of the Erreur Monumentale article was most unkind about the memorial in 1978, describing it as “ugly and banal”. There are certainly many more grandiloquent columns and obelisks dedicated to Cook at sites scattered around the Pacific. Yet I find something rather refreshing and human in the very modesty of the Point Venus monument, whether the coral rock had anything to do with the Captain or not. In any event, it was only after observing the Transit of Venus that Cook opened his secret Admiralty orders, and began those voyages of Pacific exploration that were to take him from the Antarctic to the Arctic Circles, further than any man had been before: from Cape Horn to the eastern coast of Australia. How wonderful, then, that the name of Captain James Cook RN is once again engraved in bronze on his monument at Point Venus where in this sense his three revelatory voyages commenced, and to which he always returned. The Geographic Journal, Vol LXXXIX, No 1, pp 54-58 (January 1937). Mémorial Polynesien, 1978, article entitled ‘Erreur Monumentale’. Tahitipresse,15 July 2009, article relaunching Pointe Vénus project. Anthony Hill, Captain Cook’s Apprentice (Penguin, Melbourne, 2008). 3. Cook new 2: The restored memorial, showing “Cook’s stone” in relation to the plaque, courtesy G Raynal. 4. Cook stone: Close up of “Cook’s stone” showing painted brass plate with engraved directional line, courtesy G Raynal.